This recipe for chicken chop suey comes from cookbook author Deh-ta Hsiung, who writes that it is "the classical 'Chicken Chop Suey' dish that heralded Chinese food to the western world at the end of the nineteenth century..." - it is rather amazing to think that one of the world's greatest cuisines should have been represented by a dish that did not even originate in China itself, but thousands of miles away in San Francisco, USA! Mix the shredded chicken with a pinch of the salt, the egg white, and about 1 teaspoon cornflour/cornstarch paste. Blanch them in warm oil and stir to separate. Then remove and drain them. Pour off the excess oil, leaving about 2 tablespoons in the wok. 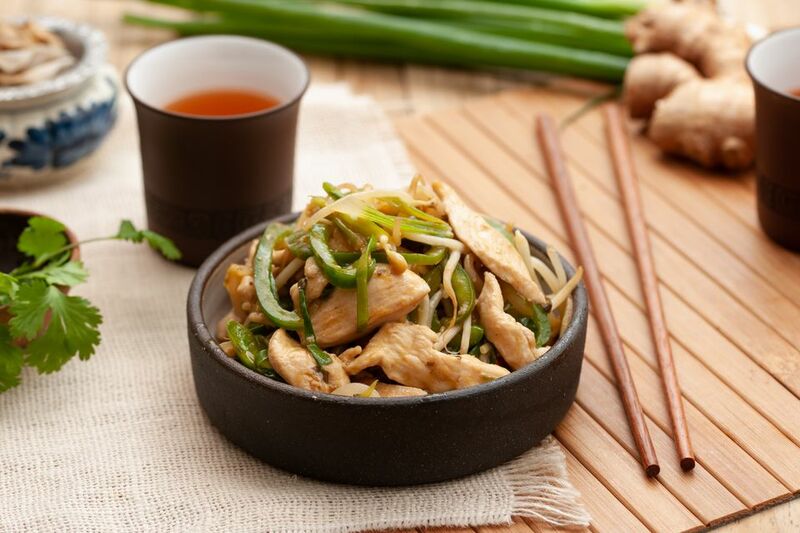 Add the ginger, spring onions, bean sprouts, and green pepper, and stir-fry for about 1 minute. Mix in the salt and the sugar, and blend well. Place the chicken back in, along with the soy sauce and rice wine, and stir-fry for another minute. Then add the stock and MSG, if using. Thicken the gravy with the remaining corn-flour paste. Garnish with the sesame oil, and serve hot. Pour about 1 pint vegetable oil into a pre-heated wok or saucepan over a high heat. Add 2 to 3 small pieces of ginger root. In a few minutes, the ginger pieces should rise to the surface. Now watch the color of the ginger; when it turns from pale yellow to dark brown, turn off the heat and let the oil cool down a little before removing the ginger pieces. Store the seasoned oil in a container.